There are many unique containers available in which cremated remains can be kept, ranging from a favourite cookie tin to garden sculpture. Or perhaps you prefer to commemorate the life of loved one within a personalised ceremony? Ashes can be scattered while on a favourite walk or placed into a rocket and become part of a firework display? 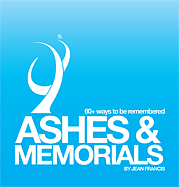 For more ideas see my book: Ashes and Memorials – 60+ Ways to be Remembered. If you are considering scattering or burying cremated remains on private property, permission of the landowner should be sought. If a public place is your preference, permission should be gained from the appropriate authority. 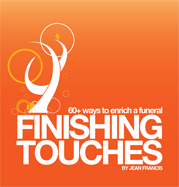 Cremation has become more popular in recent years. If you are considering this, please be mindful that, in spite of strict government legislation, 12% of all carcinogenic pollutants in the atmosphere come from crematoria. Bear in mind also the enormous amount of energy required for fuel. 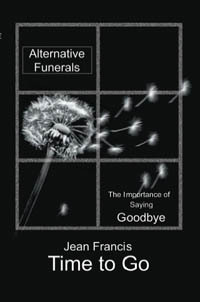 To help reduce emissions, make funeral arrangements with environmental awareness; choose a coffin that is made from natural materials, there are many choices available. Dress or wrap the body in natural fabrics. Use locally grown, seasonal or garden flowers, avoiding those grown in hot-houses and transported by air. Share transport, maybe hire a bus to carry the coffin and mourners to avoid parking problems. Make donations to a favourite charity and plant a tree in memory of the deceased. ‘Jo, Roger, Felicity and I all want to thank you from the bottom of our hearts for everything you’ve done for us. You made the day complete with your wisdom and kindness. So many people have been thanking us by email and letter, it’s been quite overwhelming. Mum and Dad would be proud.’ Anna.